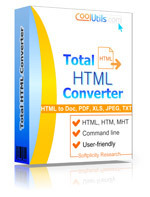 Total HTML Converter converts HTML or MHT files to Doc, PDF, XLS, JPEG, TXT in bathes. FLASH is also supported. It can be handled via well-thought user interface or command line. There are lots of conversion options like Fit HTML Width To PDF-Page-Size option (useful when you print html-tables), or IE Footer & Header support. Total HTML Converter is very easy-to-use. It's suitable for both advanced users and beginners. Besides, it's very fast and reliable. Use Html Converter and all tedious converting manipulations will turn out to be simple. Just download your copy for free and try it. Total HTML Converter is your best choice to convert batches of HTML/MHT files to other formats.